What is Sharagamana Mudra? The mudra of protection or refuge-giving is commonly seen in Tibetan art on the various images of Avalokitesvara. The gesture may be made in several ways – with the palm facing upwards and outwards, or downwards so as to subdue the object that is the cause of fear. In another variation, the index, middle or ring finger may be joined with the thumb tip to form a circle, with the remaining three extended upwards. Taking refuge is the union of the male and female principle, while the other fingers represent the Buddha, dharma and sangha (The Three Jewels). The varied images of Taras are typically shown holding a lotus in their left hands in the circle of thumb and fingertip. 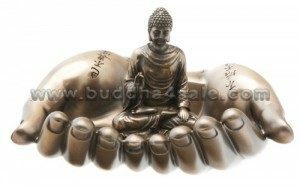 So where is the best FengShui placement for a Sharagamana Mudra Buddha? It is highly recommended to consecrate a Sharagamana Mudra Buddha at the main entrance of your home, the center of your home, prayer room or altar, etc. Just by looking at this Buddha hand gesture one can connect to the energy of deep peace and serenity. It is a powerful FengShui decor adapt to any places!